This IBM Redbooks publication provides best practices and guidance for building a secure collaboration infrastructure utilizing IBM Lotus technologies. 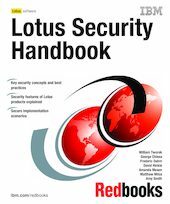 It is the third Lotus security oriented book to be published. However, unlike the previous two Redbooks in this series, “The Domino Defense: Security in Lotus Notes 4.5 and the Internet” (SG24-4848) and “Lotus Notes and Domino R5.0 Security Infrastructure Revealed” (SG24-5341), this third book focuses not just on Notes/Domino - but on all IBM Lotus collaborative products, as well as general security best practices for any infrastructure. This book should be considered essential reading for anyone responsible for Lotus technology based applications, systems, and infrastructures. Part 1 introduces the basic concepts related to security, and then covers a number of methodologies for architecting and deploying security from beginning to end in an organization. Part 2 delves into the specific concepts and components involved in a secure infrastructure. This includes discussions about security zoning, single sign-on (SSO), public key infrastructures (PKI), and directory strategies. Part 3 discusses the specific security features in the latest versions of Lotus products. Detailed security features of Lotus Notes and Domino 6, Sametime 3, QuickPlace 2.08, Domino Web Access (iNotes), WebSphere Portal, and other IBM/Lotus collaborative technologies are all discussed. Part 4 provides a real-life scenario demonstrating the secure implementation of Lotus collaborative technologies, following the guidelines and best practices provided in the first three parts of this book. NOTE: Also available for download via the "additional material" link in the right-hand corner of this abstract page is the Microsoft PowerPoint presentation from the recent Redbooks Lotus Single Sign-On Solutions webcast, which was based on the SSO content from this book.